Israel’s Minister of Education has proposed the adoption of a code of ethics for academics that some worry poses a threat to the academic freedom of professors there. The code was authored by Asa Kasher, the Laura Schwarz-Kipp Chair in Professional Ethics and Philosophy of Practice at Tel Aviv University. According to Haaretz, the code would limit the political speech of faculty in the classroom, forbid them from calling for boycotts of Israel, and require universities to establish offices to monitor the political activity of faculty and staff. Many academics in Israel opposed the idea of a government sponsored code of ethics even before the details of the proposed code were publicized. The ethical code that is being proposed unreasonably expands the definition of what is political. The definition does not differentiate between political and the public, between political and ethical, and between systematic preaching and free discourse. Political activity, according to the proposed ethical code, includes all direct support or opposition to ‘a particular point of view in a recognized public dispute’. Thus, the proposed code refers to many questions of economics, ethics, law, and political morality as political and calls for their removal from academic discourse. I tried to obtain a copy of the code’s text to see whether the characterizations of it were accurate and the objections reasonable. Unfortunately, the only version available (sent to me by Professor Kasher) is in Hebrew, which I do not read [note: see update for translation]. If you do, you can read it here (and consider yourself encouraged to make an informed comment on it, or provide translations of the relevant passages). Professor Kasher, who is also the author of the Israel Defense Forces’ Code of Conduct, has not yet answered a request for a response to critics of the proposed code (though that request was made rather recently). If he does send me a response, I will post it as an update here. 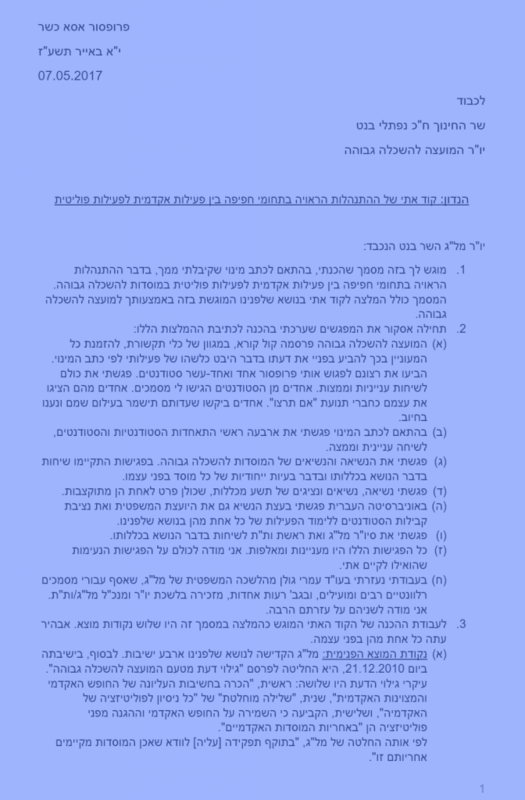 UPDATE: Alon Harel at Hebrew University has kindly provided an English translation of the proposed ethics code. You can access it here. A member of the faculty of an institution of higher education will take care not to act, outside the domain of his freedom of research and teaching, in a way that harms, intentionally or knowingly, the institution, its faculty, its other workers, its property, its academic work and its academic reputation, in Israel and in the academic world elsewhere, and he will also steer clear of urging others to do so. A member of the faculty of an Israeli academic institution will not participate in an academic boycott of Israeli academic institutions or in a call for others to participate in such a boycott or support it.